Nell Haynes is an Assistant Teaching Professor in Anthropology at Georgetown University. Her research addresses themes of gender & indigeneity in Latin America. Specifically she is interested in the ways that notions of who counts as "authentically indigenous" become expressed through and troubled by popular culture and media. Nell earned her Ph.D. in Anthropology at American University in 2013 with a concentration in Race, Gender, and Social Justice, and holds a Bachelor of Science Degree from Northwestern University in Anthropology and Theater. Nell has previously worked in Anthropology and Indigenous Studies at Northwestern University, Pontificia Universidad Católica de Chile, and University College London. Nell is author of Social Media in Northern Chile (2016) and co-author of How the World Changed Social Media (2016), now the MOST READ E-BOOK ON JSTOR. Nell is currently working on her second book, based on fieldwork in La Paz, Bolivia. The book explores how the pop culture spectacle of lucha libre, featuring women as chola characters, reflects and contributes to current debates over the nature of indigeneity in Bolivia. Nell has also published in a number of edited and co-authored books, as well as prestigious academic journals. Her courses concentrate on Indigeneity, Latin America, gender & sexuality, linguistic anthropology, performance, media, popular culture, borders, & migration. ​My blog, written with Bolivian activist and scholar David Aruquipa Pérez, examines how political allegiances and competing priorities have shaped equality movements for LGBTI Bolivians, and thus, their histories. 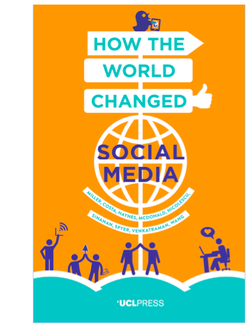 ​HOW THE WORLD CHANGED SOCIAL MEDIA is the MOST READ OPEN ACCESS E-BOOK ON JSTOR!!! This book offers a comparative analysis summarising the results of the ethnographic research exploring the impact of social media on politics and gender, education and commerce. What is the result of the increased emphasis on visual communicatin? Are we becoming mroe individual or more social? Why is public social media so conservative? Why does equality online fail to shift inequality offline? How did memes become the moral police of the internet? How the World Changed Social Media argues that the only way to appreciate and understanding something as intimate and ubiquitous as social media is to be immersed in the lives of the people who post. Only then can we discover how peole all around the world have already transformed social media in such unexpected ways and assess the consequences. Go to the UCL Press website to order your copy or download free PDFs. Based on 15 months of ethnographic research in the city of Alto Hospicio in northern Chile, this book describes how the residents use social media, and the consequences of this use in their daily lives. Nell Haynes argues that social media is a place where Alto Hospicio’s residents – or Hospiceños – express their feelings of marginalisation that result from living in city far from the national capital, and with a notoriously low quality of life compared to other urban areas in Chile. In actively distancing themselves from residents in cities such as Santiago, Hospiceños identify as marginalised citizens, and express a new kind of social norm. Yet Haynes finds that by contrasting their own lived experiences with those of people in metropolitan areas, Hospiceños are strengthening their own sense of community and the sense of normativity that shapes their daily lives. This exciting conclusion is illustrated by the range of social media posts about personal relationships, politics and national citizenship, particularly on Facebook.